Led by host Kate Humble, five scientists are challenged to put their collective scientific knowledge to practical use. Transported to isolated locations, they are presented with a series of tasks, with two notable restrictions: they must complete their work within three days and, with the exception of a rudimentary tool kit, must use only indigenous materials. 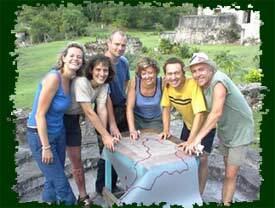 The first six episodes find our group on the Caribbean island of Carriacou. The last four programs place our scientists on Capraia, a similarly isolated Mediterranean island. Rough Science was produced by the BBC and Open University, in association with WETA Washington, D.C. Major funding for Rough Science is provided by the National Science Foundation. Corporate funding is provided by DuPont.